I invented a new tech product for the corporate legal market. I have no qualms labeling it “the ultimate disruptive game changer.” I hope you are sitting down for this.The Magic Money Machine™ is a proprietary IoT cryptocurrency platform that leverages blockchain technology and deep-learning algorithms to reduce friction in the legal supply chain. Inside and outside counsel need only to both plug in the MMM (sadly, my branding team tells me that M&M, 3M, and M3 all seem to be taken). That’s it. No learning curve. No changed behavior. No implementation dip. No risk. Also I am giving it away free. I charge only for shipping and handling (order now and get a second one at no additional charge). If both sides have the MMM plugged in, the corporate client’s costs will be reduced by 25%, and the law firm’s profits will increase by 25%. A win-win from mutually beneficial collaboration, a truly beautiful thing. So here’s the question: how long will it take MMM to reach market saturation? We’ll define saturation as in use by a majority of lawyers in the Fortune 200 and Am Law 200. Because this is a thought experiment predicated on an unadulterated no-brainer, the gut response should be something along the lines of: tomorrow. MMM should be a phenomenon that spreads faster than photos of a shirtless Tongan Olympian. But, of course, that’s not how it would happen. Because issue spotting is kind of your thing, you immediately diagnose the core failing of my go-to-market strategy: Dude, it doesn’t exist. What do you expect? You’re, literally, pedaling magic. Even if you could invent it, no one would take you seriously. It is too far fetched. You need to focus on solving real, well-articulated problems with practical, extant solutions. Pragmatism. Calibration. Bricolage. Not fantasy nonsense. Fair. Though let me ask you this: how likely are we to devise an innovation more practical than boiling water? Is any problem we’re solving more immediate and impactful than eliminating typhoid and other water-borne diseases? No? Then I’ve got news. Rogers— he of adoption curve fame—opens his textbook, Diffusion of Innovations (5th Ed), with a case study of a health worker who spent two years failing to convince a Peruvian peasant village to boil water. The village had a public health crisis. Boiling their drinking water would solve it. Only 11 out of 200 families accepted and incorporated a simple practice that was free and would deliver immediate, tangible benefits. Rogers deploys the anecdote to introduce the critical point that innovation is largely a social process, and we ignore the structural barriers to innovation at our peril. I use it here to make a smaller point about empathy—our practical solution may be someone else’s nonsensical magic. Again, you, my beloved strawman, are a master advocate: Way to cherry pick a super sad story, bro. The plural of extreme anecdote isn’t data. And you are comparing professionals to Peruvian peasants. How about doctors? There is an eerily similar story to tell about the decades it took doctors to accept and start to apply the empirical evidence that washing their hands before surgery was in the best interest of their patients. Come on, my guy, stop the silliness. That was almost two centuries years ago. You keep not describing the world we actually inhabit. How about studies from 1996, 2009, and 2016 about doctors still not washing their hands nearly much as, well, doctors recommend? There remains the inconvenient fact that medical error is the third leading cause of death. Atul Gawande’s The Checklist Manifesto is not only one of the most important books of this decade, it is also one of the most tragic. It is a painful tale of how hard it is to get autonomy-loving professionals to do simple things which they should very obviously be doing (see also teachers). Yeah, whatever. Everyone knows that medicine is mostly about signaling care, not science. If you think about it, invisible little organisms and unseen bodily processes share many properties of magic. They are hard to integrate into our mental models even when we have the vocabulary. Is there really that big an intellectual distance between a healthy gut microbiome and midi-chlorians? No. No, there isn’t. But for many nose-to-the-grindstone legal professionals there also isn’t that much to distinguish the Magic Money Machine from obscenely practical approaches like prevention, Lean, after-action assessments, and #DoLessLaw, let alone the mystic arts of analytics, algorithms, and distributed ledgers. But, sure, let’s make innovation more transparent (if not more practical) than boiling water and washing hands and see where that gets us. Much has been made (including by me) about the day in 1997 when “In brisk and brutal fashion, the I.B.M. computer Deep Blue unseated humanity” by beating then-champion Garry Kasparov at chess. At the time of the shellacking, this was deemed “the brain’s last stand” against an AI event horizon because chess was, and remains, the domain of the cerebral. Meatheads need not apply. For 1,500 years, the planet’s keenest minds had been honing our approach to the quintessential perfect information game. In mathematics and computer science, a local optimum is the best solution to a problem within a small neighborhood of possible solutions. This concept is in contrast to the global optimum, which is the optimal solution when every possible solution is considered. You know, Casey. You are starting to bum me out. I’m losing the will to serve up any more softballs. But might I suggest that chess is not an easy problem to solve? It took the computers, and the many human geniuses behind them, almost 50 years to beat us. Maybe it’s not the best example of how people comprehend the opportunities available to them from changing ingrained behaviors? Again, fair. What about three being a larger number than two (3>2)? Is that easy enough to understand? I freakin hate you. I hate you so much. I hate your stupid face, your flippant tone, and your unconscionably long posts. And I hate myself for taking the bait. Proceed. I have to see where this goes. I adore my sons. They are my favorite humans. But I will never love them enough to deceive myself that first graders playing basketball is a pleasant spectator experience (every Saturday). What they lack in acumen, they also lack in style, grace, and understanding of the rules of the game. It’s brutal. But despite the double dribbles, poor spacing, aversion to ball movement, and preternatural enthusiasm for post-game juice boxes, their tactics are not without merit. They seem to intuitively understand that the dominant strategy is to take the most open shot possible as close to the basket as they can get. The higher percentage shot is always superior—as long as all shots are of equal value. In the NBA, all shots are not of equal value. The NBA introduced a three-point line in the 1979-80 season. The arc indelibly altered the geometry of the game. 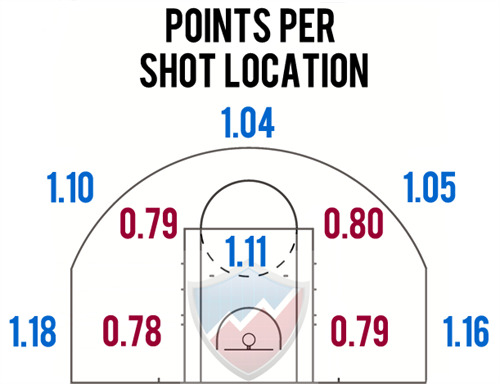 In general, the greater the distance from the basket, the lower the percentage chance a shot will go in. When all shots are worth two points, get as close and as open as you can. But with three pointers, the math changes. Returning to Rogers’ point about innovation being a social process, there is a phenomenal longform piece from Tom Haberstroh on “The NBA’s 35 year war over the 3.” Haberstroh dives into how much traditionalists hated, and continue to hate (hate, hate, hate, hate), the three-point shot. The piece quotes many of the original three-point shooting savants, like Larry Bird. High stakes. Compelling value proposition. Easy math. Transparent, competitive environment. And yet extremely slow to change. Even those who directly benefited from the innovation express reservations about resulting shift in the strategic equilibrium. It’s a familiar story (see also football and baseball, as well as Mark Cohen’s great piece comparing the legal market to the latter). The foregoing material came out of a hopeful talk I recently gave to a law company. I found inspiration for the post at the wonderful ALT conference I attended last week. Hopeful? Inspired? There is something seriously wrong with your brain. You just told us people won’t boil water to keep themselves and their families from falling ill. You told us doctors are selfish killing machines. You told us that even chess prodigies get snared in false mental constraints. You told us it can takes decades to come to terms with 3>2 even when glory and millions of dollars are on the line. How is that hopeful for anyone who wants to make change in the legal industry? Because (a) the frustrations of the legal change agent are not unique and (b) there was real, material change in every scenario I presented. Some innovations are just slow. The Magic Money Machine is intended to trigger our intuitive mental model of change. This makes sense. So this will happen. Soon. Everywhere. We do not naturally think in systems. Systems have emergent properties, many of which promote stability and therefore impede the diffusion of innovations. The boiling-water anecdote demonstrates those systems at work while also illuminating the curse of knowledge. The curse of ignorance is that we don’t know what we don’t know and therefore labor under delusions of adequacy. The curse of knowledge is that once we know something, it is hard to imagine not knowing it. The resulting mistakes about shared assumptions can be invisible barriers to change. These unrecognized barriers are why with boiling water the change only occurred among a small set of outliers. The dirty-handed doctors did change. But they resisted change for a long time. Even after the change became established practice, maintaining the modified behavior at an appropriate level requires discipline, rigor, and monitoring (as you learned when you clicked the links, which I’m sure you always do). Chess strategy was always evolving. Evolution accelerated with a large, exogenous shock: a vastly superior player being introduced suddenly. The best human players were then afforded the opportunity to practice against this superior player all the time. Of course they got better and adopted some of its strategies. And the NBA has embraced the three-point shot. It just took a while. I relayed simplified stories. I omitted confounding factors (my posts are too long as it is). There was a material omission in my narrative about the NBA: in the beginning, the players were mostly terrible at a shot they had never practiced. So the shot’s expected value was low. With a low expected value, it was inadvisable for coaches to design offensive systems around three pointers. It was rational for players to continue to focus on developing skills that fit the coaches’ systems. Which meant the coaches didn’t have the personnel. Which……. Despite this chicken-or-egg problem—exacerbated by traditionalist caterwauling about ‘the way the game is supposed to be played’—the systems, personnel, and skills evolved to conform to the logic of the changed reality. It was incremental. But it happened. I know this because I am doomed to live with three Golden State Warriors fans. They are insufferable. Each story resembles the legal market in some way. We want to pull our hair out because it often seems like only outliers are willing to incorporate the obvious and practical (boiling water). A major impediment to innovation is autonomy-loving professionals resisting reasonable recommendations to modify their behavior for the benefit of their clients (unhygienic doctors). Mix in some exogenous shocks—like the Great Recession—and some automation anxiety (chess). And you get slow, uneven movement towards a new normal (NBA) as regulations, systems, skills, and mindsets incrementally co-evolve. The final story is closest to my view of the legal market. Except we’re the NBA circa 2001 (too much iso-ball). I see change. I expect change to continue, albeit incrementally. We may enter a period of rapid evolution. Or not. Regardless, unless you are operating on a short time horizon, betting on change is safer than betting against it from a portfolio perspective. But that does not mean all bets on change will pay off, especially in the near term. This was my message to the law company. They believe they have an irrefutable value proposition (Magic Money Machine) and have proven it works. Yet much of the market still reacts with a yawn. I tried to validate feelings—their frustrations are righteous. I wanted to reassure them that they had not made some grave mistake in choosing law—inertia is an issue everywhere. I attempted to offer some explanations for the gap between their expectations and reality. And, finally, I wanted to communicate a long view premised on muddled movement in the right direction. Any of other message would have rang hollow. It would have been ludicrous to tell them that real change can’t happen. They are a manifestation of that change. They’ve grown 10x over the last decade and the “gnat in an elephant’s ear” is beginning to buzz pretty loud (for reasons). At the same time, a rah rah speech on how everything is awesome and immediate, rapid change is inevitable would have struck a false note. Their 10x growth was hard won and, anyway, should have been 100x. We continue to live in a Sisyphean world. 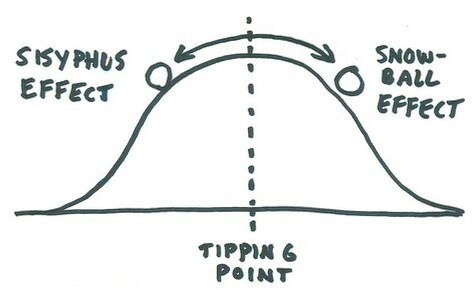 And no one truly knows where the tipping point might be, if one even exists. But that’s ok. We’ve come a long way. And we continue to push forward. That was one of my takeaways from the excellent ctrl-alt-del Conference I attended in beautiful Scottsdale (oddly, a better February venue than NYC). As I noted in the ReplyAll conference thread, I was enamored by the history lesson. Rick Hellers traced ALT’s origin back 35 years to user groups for VSLUG and LAWNET. At the time, they were law firm professionals helping each other navigate the application of technology to improve the practice of law for the benefit of clients. They’re still at it. And they’re as passionate as ever—made abundantly clear by the lively interactive sessions (stellar conference design). When I, too, was a disaffected Biglaw associate, I would have ridiculed Zach Abramowitz’s pre-conference thesis about the important role law firms play, and will continue to play, in delivering and spreading innovation. But then I went in-house. After that, I founded a legal tech startup and began consulting. I eventually came to terms with the reality that innovation and frustration coexist everywhere in our ecosystem. Both were in evidence at ctrl-alt-del with a strong emphasis on the innovation. Candidly, for too long, I fixated on the frustration. But the magnificent Bill Henderson introduced me to Rogers (whose text I am sure will inform the new Institute for the Future of Law Practice). Maybe there is something wrong with my brain, but I found enormous comfort in learning how much work and savvy is required for a well-intentioned change agent to convince people to boil water for their own good. We’re not that extreme in our change aversion. We’re not hopeless. We’ve not reached some state of innovative perdition. When we get past the constant disappointment that accompanies a Magic Money Machine mindset, we can appreciate just how much we have changed and recognize that change will continue. We need not delude ourselves that change will come easy as long as we remain convinced that the hard work will be worth it. We can be hopeful without being satisfied. Update: My great friend Andrew Arruda, CEO of ROSS, needled me privately (in good fun) for borrowing the MMM idea from him. I don’t believe that happened. But I have strong feelings about proper attribution and if Andrew says that is what occurred, there is a good chance it did. I have no doubt I unconsciously appropriate ideas and then pass them off on my own. Here, however, I have a distinct memory of presenting the MMM concept to the irreplaceable Ken Grady long before I had the fortune of meeting Andrew. As anyone else who has had their dreams squashed by Ken will attest, the man makes his mental mark. The sting of being confronted with your own intellectual inadequacies stays with you. Like so many, I owe Ken an unpayable debt for introducing more rigor to my scrambled thinking. At the time, I wanted to poll people on the question of how long the MMM would take to achieve market saturation. I was trying to gauge the way we think about the diffusion of innovations in the legal industry. The Dream Squasher responded, in no uncertain terms, that my idea was a waste of time. Ken was right. The proposed approach had almost no chance of success. The setup would have confused far more than it enlightened. I’m grateful that Ken convinced me to let the concept marinate. I recall that distinctly and therefore have a hard time crediting Andrew’s account. But memory is fallible, malleable, and predisposed to obsequious self-flattery. I will gladly share my modest spotlight with the famous Mr. Arruda, who is one of the most charismatic and passionate people you will ever meet.